Amazon has finally taken the wraps off its much rumored, often leaked smartphone. Dubbed Fire Phone, the device features a 4.7-inch display, a quad-core 2.2GHz processor, Adreno 330 graphics and 2GB of RAM. That’s right in line with what we’ve been hearing so far, and so are the multiple cameras around the front to aid rendering 3D elements on screen... more on that later. Jeff Bezos touted the use of premium materials for the Fire Phone, with a rubberized frame, Gorilla Glass 3 on both sides and aluminium buttons. They also used injection-molded steel connectors, which means no wobbly USB port as some Android devices are prone to suffer from. Around back is a 13-megapixel camera with an f/2.0 lens and optical image stabilization. Bezos compared a few low light shots with samples from the Galaxy S5 and iPhone 5S where the Fire Phone came out on top -- but you’d expect that, of course. There’s also a dedicated shutter button that launches the camera app and free unlimited photo storage with Amazon Cloud Drive. Amazon went through a ton of features on stage, including the same Second Screen and X-Ray we’ve seen on the Kindle Fire, as well as Mayday and the recently launched Prime Music. Most notably, the company introduced a new feature called Firefly that can scan numbers, books, DVDs, and millions of objects in seconds and present you with relevant information or buying options. It even recognizes songs and TV shows. But without a doubt the feature that’s likely to garner the most interest is what Amazon calls “dynamic perspective.” Amazon’s much rumoured 3D effect isn’t so much about projecting images that pop out at you, but rather inward with 3D images viewable at different angles as you move and tilt the phone. Amazon showed off the effect on a few lock screens, a maps application, a gallery of dresses and one game. Throughout the OS you’ll also see a more subtle parallax effect on the icons and other elements. While attendees seemed impressed by the overall result, Amazon's challenge will be to prove its usefulness in real-world scenarios beyond a mere gimmick. Part of that will be up to developers, who will be getting access to SDKs for both Dynamic Perspective and Firefly. 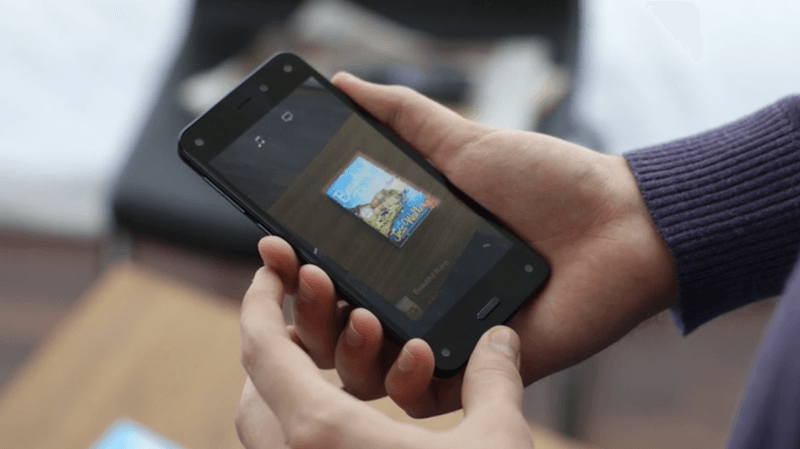 Pre-orders for Amazon’s Fire Phone are open now but the device won’t ship until July 25th. A 32GB model is selling at the standard $199.99 on contract with AT&T, or $299.99 for 64GB. Both come with 12 free months of Prime.